I've seen some cool business cards in my time—I remember that at my first GDC, I practically had a Patrick Bateman-style existential crisis over how inferior my own cards were at the time. But Sim City and Spore creator Will Wright's got us all beat—he puts his personal information on actual printed money. 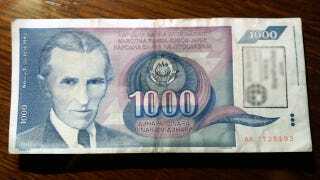 Sure, it's Yugoslavian money that has no longer has any actual value, but if anything, that makes it cooler. The image of the "card" itself was shared by The Atlantic's Alexis Madrigal, who got the card while interviewing Wright.